It's been far too long since we caught up! I feel like a lot has happened since my last Sunday post, both with my life and with this blog. Firstly, it was my 22nd Birthday on Monday. It was a bit of a weird one as it didn't really feel like a birthday! I wasn't allowed the day off work and I was super-tired so it sort of passed like an ordinary day. Although a very good friend of mine came and met me for lunch at the Alchemist. It was really lovely to catch up with her on my birthday, although I wish I'd been able to stick around longer. If you'd like to see what I got you can check out my post here. It's a bit of a strange feeling to be properly into my 20s but I feel as though my life is coming together finally! As you may have noticed there have been some big blog changes around here and whilst I wrote a proper post on it, I thought I'd update you. I've had my final, finishing touch added (I've decided Wordpress migration is an adventure for another time...) which is the header. I wanted to keep my layout clean whilst adding in a touch of personality and I think these illustrations do the job perfectly. I contacted Maddy from the blog Unstitched after seeing her illustrations on phone covers and she put together these images for me based on my blog. They're just so 'me' it adds the bit of individuality I'd been after. Also, I'm pleased to report that all my re-directs have now kicked in and my Google rankings seem back to where they were before the URL change. A lot of people on my original post said that this was a big concern for them changing their blog name. Whilst it damaged my traffic in the short-term I've seen a big boost in followers since my re-brand and also since recovering this traffic to my older posts through Google my stats are better than ever! All in all I'm so pleased with and proud of my blog since making these changes and it was absolutely the right decision for me. Another big thing that happened was that I had Shingles! I'm seriously one of those people who is never ill outside of feeling a bit sick or having a migraine for 24 hours. I started to develop a rash down one side which I thought was an allergic reaction, however after a visit to a drop-in centre I was told it was Shingles, which is why it was so painful. It sounds like something people don't get any more but it's actually a re-emergence of the chicken pox virus, which meant I had to give my boyfriend a wide birth as he'd never had it. It was absolute agony for a couple of days but after that I was more or less fine, it's just left a bit of an ugly scar! I've decided I really want to get into some hobbies I used to enjoy, like craft and baking. I could honestly spend hours (and hundreds of pounds...) in Paperchase. We have such an amazing store in Manchester and I'll definitely be checking out the teashop if I go in with a friend at the weekend. The arts and crafts floor is just amazing! I picked up a few bits, pictured above. I'm not quite sure what I'm going to do with it all but I like the idea of some of these bits in blog photos. I guess I'll probably wrap the 'J' in some of the tissue paper. I've actually already ended up framing the cream and gold polka dot tissue in the frame and I also added in the quote insert from the Stila palette I got for my birthday. Quite a crazy idea but I kind of like it, you can see the finished result on Instagram. I really love the photo frame especially as I have a mix of antique gold and copper details in my room and this is somewhere in-between, pulling the two together. It now sits atop my Muju drawers, which I've recently re-arranged as I just can't stop moving around my set-up! Another place in Manchester I find myself spending a lot of time in these days is the Northern Quarter. I feel as though despite all the years I've spent in Manchester I'm still discovering new places. I had never visited the Teacup Kitchen, though not through lack of trying! We'd always got there too late to want to wait for food or were on the wrong side of the NQ to make the trip. However I did manage to go twice this past month and it was so lovely! The selection of tea and cakes is just amazing and it was well worth the wait. Also my workplace had a big bar crawl where I discovered some bars I never even knew were there! I feel like we're so lucky in Manchester to have so many amazing shops, bars, cafes and restaurants in such a compact area. I love supporting independent businesses and rarely find myself visiting chains when I go out for food, as most places in the Northern Quarter are really reasonably priced. 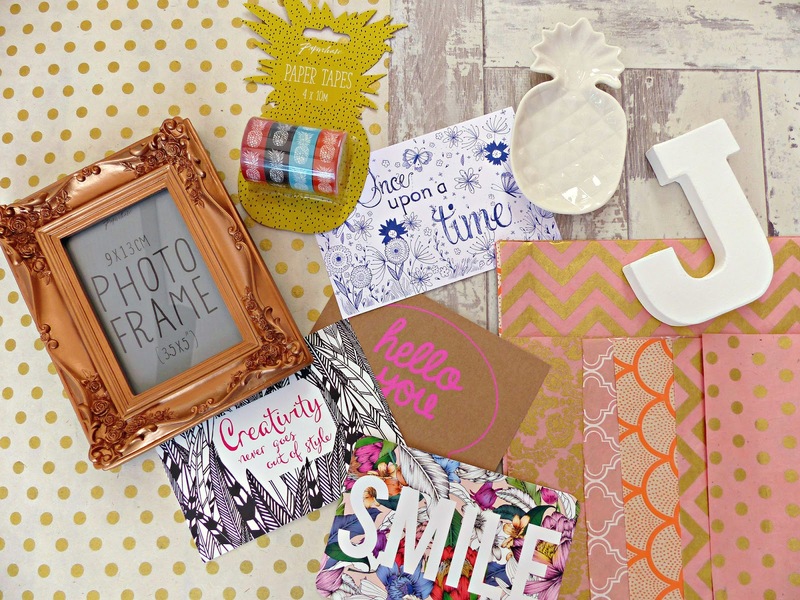 Do you have any recommendations on where to get pretty craft supplies, stationary and home wear? I love discovering new areas in the city you live in, like an adventure. Also definitely go to Paris! I went on my 21st birthday last year and headed to Disneyland and the whole thing was a dream. You'll literally never want to leave. Ahhh hope you are feeling better at least you will be on holiday soon. Love your header!. I can't remember how many revamps I did to my blog but one thing's sure, it gets better. There's always the tendency to try and please your readers but I think as long as you're happy with it and it reflects your personality the most, then you shouldn't worry. Your header is so minimalist chic and you've got a lovely blog! Happy belated birthday! I love the new header, very chic. Loved this post, Jasmine! I love reading your more chatty posts and I hope you document some of your more creative hobbies on your blog as i'd love to see them! Loving your new blog layout and happy birthday! Sorry to hear you were poorly, too! Paperchase is so lovely for little bits and pieces like this, I love the little postcards but never know where to put them! I love your new blog layout and I do hope you go to Paris! It's such a lovely city! Hope you're feeling better! Fab post, love your blog! Oh wow you had shingles! Hope you are okay now and fully recovered! So glad you got to have a nice birthday lunch but SO sorry about shingles, sounds awful :( glad you're better now. Happy the re-brand has been a success and things are going well for you :) you really deserve it as you put a lot of effort into your blog! Sorry about your Shingles. I had a friend who had it has a kid and it scarred her back pretty bad. I'm glad you're feeling better now! Also happy belated birthday Jasmine :). I could spend hours and hours in Paperchase as it's one of my favourite stores!